This project addresses the need for high-quality educational materials and support systems to advance the adoption of cover crops in the subtropics and tropics, and contributes directly to the goals of the Southern Cover Crop Council and SSARE. The SCCC was established in summer of 2016 and finalized in Athens, GA in December 2016 with support from SSARE, and is composed of farmers, service providers, industry representatives, and research and extension faculty from 13 states who aim to increase cover crop use through collaborative education and research efforts throughout the Southern region. Experts, Inputs and Services Directory to help farmers get the resources they need in a timely manner. 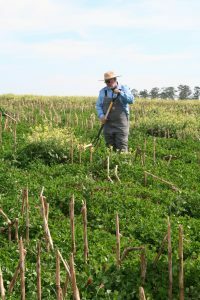 Collectively, these resources comprise the foundation of the Southeast Cover Crop Guide. The Guide is organized into nine physiographic regions and three farming systems (grazing, row and vegetable) to distinguish practices among climate, soil and system differences. We will conduct semi-structured interviews in Florida, St. Croix, and Puerto Rico to learn more about our farmers’ cover crop practices, assess their internet use habits, and determine their content needs. We will aggregate and summarize cover crop educational materials relevant to our climate zones into user-friendly materials, and add new peer-reviewed educational content including high-resolution photographs, short videos and fact sheets for the SCCC website. This educational project builds on previous and current team efforts and experience and outputs will directly reflect farmer and service provider preferences on how and why they will use the SCCC website materials. Conduct 30 semi-structured interview of farmers and technical service providers in Florida, Puerto Rico, and St. Croix and: document current cover crop practices and perceived barriers to cover crop adoption; and identify priorities and preferences for future educational content as well as electronic format, presentation, and likelihood of use. Build an annotated database from a review of 100 publications including journal articles, technical notes, SSARE final reports on cover crop grants, cover crop publications from agencies such as NRCS and ARS, as well as instructional video relevant to the subtropics and tropics that will serve as supporting documentation for cover crop recommendations in our area. Publish five new educational products and a library of high-resolution photographs for farmers and service providers based on outcomes of Objectives 1 and 2, and make these available on the SCCC website. Implement three workshops in Florida, Puerto Rico and St. Croix in Year 2 to present the content, receive critical feedback, and obtain recommendations for next steps. Project leads participated in the Southern Cover Crop Council’s annual meeting in July in Auburn, AL. The goals of this grant were shared with the 40 members in attendance. A plan of work for educational materials and social media content funded in part by this project was proposed and supported by the membership. Educational materials including ecophysiological regions of FL, PR, and USVI, as well as sources of seeds, equipment and experts in all three locations were developed and shared with collaborator J. Gaskin (UGA) for the Southern Cover Crop Council’s website (www.southerncovercrops.org). A photo database of high-resolution photographs has been initiated and currently hosts 48 high-resolution images and videos, contributed by members of the SCCC. Each photograph is tagged with metadata and a short ADA compliant description. Also, permissions for educational use are granted and recorded. Finally, several SCCC documents were created for shared use by members including an introductory slide presentation introducing the SCCC’s mission and opportunities for engagement and benefits to farmers and service providers. A proposal inclusive of interview questions and study methodology was submitted to the University of Florida’s Institutional Review Board (IRB) in September 2018. The study was approved and granted exempt IRB201802091. Travel to St. Croix and Puerto Rico to conduct farmer interviews, finalize plans for the fall workshops and review/improve drafts of educational materials is scheduled for May 13-19. Three students were hired at the University of Florida to develop educational materials for farmers and service providers, and they are working collaboratively in a shared folder space. The team meets weekly to review progress. UF/IFAS Extension Jefferson County hosted a soil health and cover crop field day and organized by state and county Extension faculty including the project PI on February 7, 2019. The program was attended by 70 farmers and service providers and included a farmer cover crop expert from NC as a keynote speaker, and several shorter presentations by UF faculty (including this project’s PI who presented Multi-species cover crops for improving soil health). Following a sponsored lunch, participants toured a farm where several cover crop strategies were in use. According to the Soil Health and Cover Crop Workshop evaluation responses (n=53), one half were farmers. Among the thirty (30) farmers who described the duration of their cover crop use, there was an even distribution in terms of their history of growing cover crops; 28% had grown them for 10 or more years, 21% had grown them for 3-4 years, while 3 groups of 17% each had either grown them for 1-2 years, 5-9 years, or had never grown a cover crop. About 20 farmers shared information about their typical crop rotation, including when they typically sowed cover crops. When asked about the potential barriers to cover crop adoption, there were between 35 to 40 responses. The top problems identified as a “Very serious problem” were Lack of Knowledge (21%) and timing of planting (18%). The top problems identified as “Moderate problem” were Annual Cost (48%), Equipment (44%), Lack of knowledge (37%), Labor (34%) and Interference with cash crop (32%). The top minor problems were Timing of planting (38%), Labor (36%), Annual cost (35%) and Equipment (31%). Most farmers found all presentations “Helpful,” as a range of 65% to 92% indicated so. Ninety-five percent (95%, n = 44) stated that they were planning to make a management or practice change because of the information shared that day. Respondents (n = 42) identified at least one of the educational sessions as the source of information for their planned change as follows: Implementing a cropping & livestock system on your farm (52%), Multi-species cover crops for improving soil health (74% or 31 farmers), Economics of cover crops (40%), Adding value to the farm (69%), and Climate forecast for 2019 (31%). Respondent’s suggestions for future cover crops and soil health programs included (in order of frequency from most frequent to less frequent): Include more farmer speakers, equipment discussions, more practical/hands-on programs, organic production, perennial systems, cattle integration, techniques for planting and killing crops, and touring farms. Our team’s general observation is that the coalescence of faculty, service providers and experienced farmers are creating an environment that makes the information more accessible and farmers appear to be more willing to try cover crops. For example, a cover crop workshop was offered in FL in March 2018 before this grant began. During our Soil Health and Cover Crop Workshop in February, four out of 12 respondents (25%) stated that as a result of attending the March cover crop workshop they made positive changes to their system including changing the cover crop species they were using, initiating soil sampling for soil health indicators and adopting cover crops. Similarly, we will pose the same question to participants in our fall workshop in Florida. Farmer knowledge gain will also be measured after the workshops scheduled for fall 2019.